“What may be surprising is the fact that a book on a specialty topic like edgings could turn out to be so useful and lush as this one. This book is so inviting and so easy to use.”—Booklist. “[This] embraces a love for detail. You'll turn to these pages time and time again.”—Vogue Knitting. 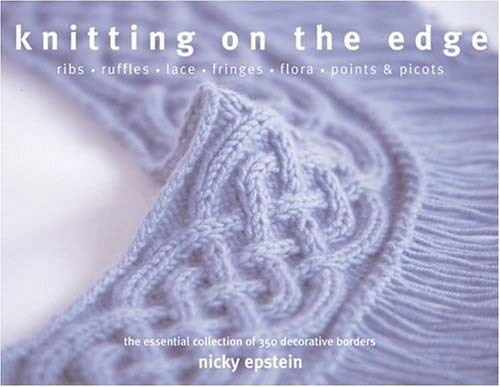 Compiled by an acclaimed knitwear designer and teacher, this collection of 350 knitted edgings, borders, and trims runs the gamut of styles and offers something for all tastes. A wealth of individual project ideas are featured for ribbed edges, ruffles, lace, fringes, flora, and garters. Color photographs accompany each of the designs, which rely upon readily available yarns and which come complete with line-by-line stitching instructions. Decorate cuffs, finish hems, and customize your own unique sweater. Develop distinctive styles and patterns using ideas such as the feather lace ruffle, bel epoque, garter stitch weave, sea scallop edge, sugar drop and much more.